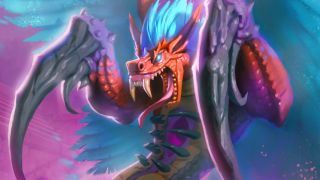 Hearthstone players were delighted when Hakkar, the Soulflayer showed his scaly face in the Rastakhan's Rumble expansion. This imposing neutral minion card pays tribute to a legendary, totally unintended moment in World of Warcraft history when players started a Corrupted Blood pandemic that left thousands of bodies in its wake within the major cities. Now Hearthstone is taking Hakkar's legacy even further with a handsome Hearthstone card back that will slowly spread and infect players around the world. You'll definitely want to add this feathered bit of fanciness to your collection, and it's easy to do. Starting with a few key players - influencers and press, mostly - Blizzard planted the seed for Hearthstone's Curse of Hakkar. Anyone who plays against someone with the Mark of Hakkar card back with find themselves infected after the match concludes, and the card back will now be in both players' collections. And so the path of the Corrupted Blood virus continues, branching out in huge swaths within the playerbase until every Hearthstone card is tainted with by the Blood God's influence. This card back is already so prevalent that it's extremely easy to catch the bug for yourself. I managed to face an opponent rocking the Mark of Hakkar in my very first post-patch match in the Tavern Brawl, so it shouldn't be long before you play against someone who's eager to spread the plague. Keep in that mind that you should play the match out rather than conceding, as ending the match too early could deprive you of your reward for that game. And if you're a good, contagion-sharing samaritan, you should keep the card back equipped for a few days just to keep the Hakkar train rolling and pay it forward to your fellow tavern dwellers. The Hearthstone team has outdone itself with this freebie; experimental mini-events like the Curse of Hakkar are great, and the card back itself looks great, with Hakkar's purple feathers and freaky red pincers intertwining in a nice composition. There's evidently no time limit to this event, so the virus can theoretically spread forever, even to new players who pick up Hearthstone months or years from now. So what are you waiting for? Get out there and transmit Hakkar's virus already! If you're just starting out in Blizzard's wildly popular card game, here are the best Hearthstone decks for beginners.